For those of you who wish to expand your horizons, this book may be the answer you have been looking for. A Modern Approach to Two-Over-One was written for the player who already uses a basic two-over-one approach, but is looking for more comprehensive methods to “glue” his system together. Special modern treatments and conventions are introduced to help cover the outer edges of the bell curve, allowing you to intelligently explore those “hard to reach” places. We can no longer live in the past with limited tools. If you want to be competitive in this modern age of bidding, get out of the stone age and enter the twenty-first century! Adoption of the bridge advice and strategies presented in this book into your game will result in you bidding more, declaring more, winning more, and enjoying your bridge more. The author's advice is to always evaluate your hand, and to show your "shape before strength". Better contracts and better bridge will be your reward. The book is best employed as a constant companion. It provides individual advice, partnership strategies, and system recommendations that are consistent and holistic. Enjoy! There are plenty of bridge books for serious players, and also a number of books for raw beginners. However, very little has been published for the player who has completed the Basic course and is now ready to add a few ‘bells and whistles’ to his or her game. This book conducts a thorough review of all the bidding ideas and concepts encountered in a Beginner course on bridge, and takes the reader beyond them, gently but firmly. The reader’s ideas on bidding will be refined, and a number of useful conventions suitable for this level of player are described and recommended. The material is written by two very experienced teachers, and includes features such as end-of-chapter reviews and quizzes to help reinforce the concepts. For Bridge Teachers: Be sure to download your free lesson plan, The Magic of Singletons and/or purchase additional teacher support materials for Teaching Bridge with Bells and Whistles. Everyone knows that control-showing bids are the expert route to slam, but it is remarkable hard to find a comprehensive treatment of this vital area of the game. Until now, that is. This is an exhaustive work, covering a lot of territory. The average reader won't agree with everything he reads - and it would be a mammoth undertaking to try and adopt it all - but it will get them thinking about their bidding and offer many ways to improve it. After all, bridge is the ultimate game for thinkers. This book fills an important gap in the literature of bridge for serious players. In the modern game, the majority of auctions are competitive, and every improving player needs to acquire the tools to handle this kind of bidding. This text covers the basic building blocks of competitive bidding (takeout and negative doubles, preempts, overcalls, competing over their notrump openings and dealing with competition over your own, forcing pass auctions, the Law of Total Tricks, and others). It describes a number of useful conventions and gadgets with which the reader needs to be familiar, and suggests other optional treatments for partnership discussion. Each chapter ends with reviews and quizzes, and the final chapter is a summary quiz covering all the material. This book will fill a major gap in bridge literature - most books on this topic are intended for expert-level players. Weak two-bids are well ensconced in the bridge world and are now part of any beginning program of lessons. They are, however, in that class of `most abused' conventions. An understanding of all the important tools that are at your fingertips will serve you well in making these decisions at the table. This book will walk you through the solutions to the problems you meet every day in offensive and defensive situations, delving into the more intricate aspects of the weak two-bid. The answer to your prayers - a simple, effective convention for competing over the opponents' 1NT opening bid! Originally self-published in 1996, the first edition sold out quickly, so that this much sought-after treatise has been unavailable for several years. The book describes how the convention works, and how to use it against various ranges of 1NT opening bids, as well as over strong 1 Club openings. Bridge players are taught numerous rules to help them make good bidding decisions, rules that involve things like point count, losing trick count, the Law of Total Tricks and a host of other evaluation methods. But eventually everyone discovers that there are more situations where these rules don't apply than where they do. This book fills a gap in bridge literature by discussing how to make decisions in the bidding, especially in competitive auctions. Think about your own game. Are you sure you know when it's right to be aggressive and when to pull back? When to bid on and when to double the opponents? When to push forward for a slam and when to be content with reaching game? This book goes through the factors you need to be aware of in your hand and in the bidding around you (partner's and the opponents') that will help you get these decisions right more often. Filled with real-life examples, practical advice and helpful quizzes, this book will help any reader become a better bidder. To be successful, a bridge player has to think like a detective, tracking down the distribution of the unseen hands. Although many players are oblivious to them, the tell-tale clues are there, just waiting to be noticed. They are there in the auction and in the opening lead. Every time a defender plays a card, declarer receives information. Similarly,everything that declarer does can be turned to advantage by alert defenders. There is even vital intelligence to be gained by thinking about what a player does not do! In this book,you will learn where to look for these clues, and, more importantly, how to draw the correct inferences from them. From there, it is only a short step to making bids and plays based on those inferences,and thereby becoming a much better player. The logical follow-up to the author's best-selling Competitive Bidding in the 21st Century, this book deals with the latest expert thinking on constructive auctions at bridge. As usual, Miles' ideas are cutting edge, and not everything he recommends will appeal to everyone. However, also as usual, he challenges his readers to think and question what they are currently doing, and convince themselves that it is indeed the best approach. This is not a book for beginners, and will not bore you with rehashing things you already know. Some of the topics are somewhat controversial, and as always Marshall Miles urges his own, often original, point of view. You may not be persuaded by everything he recommends, but perhaps you will adopt part of it, and it won't hurt you to discover how some other people play, even if you refuse to play that way yourself. Here are some of the topics discussed: Game invitations after a raise of opener's major Fast arrival and picture bids When the opponents double a transfer or Stayman Mini splinters Mini Roman 2? The Kaplan Interchange Rubens advances of overcalls Ways to show two-suiters The Wolff signoff Inverted minors Playing in the opponents' suit Balancing As he often does, Miles ends this book with an 'It's Your Call' bidding quiz, with detailed discussion of options and the rationale for his own choices. Marshall Miles has been writing bridge books for more than fifty years, and during that time has remained one of the world's leading thinkers on the theory of bidding. His recent gold medal in the World Senior Teams shows that he has lost little of his edge with time. This book, a distillation of the ideas he has been developing and evolving over many years, describes what in his view is an optimal bidding system: the one he prefers to play, and the one that has brought him great success over the last several years. Serious players will want to study Miles' ideas, and adopt, if not the whole system, many of its concepts into their own bidding. This is the fifth (and according to the author, the very last - but don't hold your breath!) edition of what is acknowledged to be the definitive book on a convention that every serious player uses. Completely revised and updated from the previous version, this newest version contains even more leading-edge ideas, and is full of examples, quizzes and practice hands. A must for the tournament player. Includes, among many other features: Why you should play 1430 and 3014 RKB responses, and when The extensions of RKB: the queen ask, the specific king ask, and more How to handle voids, as asker or responder RKB in minor-suit auctions 60 practice hands for you to bid with your favorite partner This is the only book that explains every facet of one of the most popular conventions in modern bridge. What is Standard Bidding? This is an increasingly hard question to answer, but the proliferation of bridge on the Internet in pickup partnerships makes it imperative that someone does so. Perhaps the most popular natural system for the hundreds of thousands of online players worldwide is the Standard American Yellow Card, or SAYC. In this book, for the first time, SAYC is fully described and explained. This will be an invaluable to aid to anyone wanting to learn and understand SAYC, or anyone who simply knows the basics and is eager to fill in the missing pieces in their repertoire. 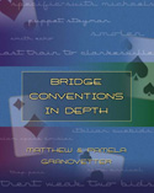 The definitive book on the oldest – and most useful – convention in bridge, the takeout double. Originally published in 1994, this book quickly became recognized as a ‘must-read’ for any would-be bridge expert, and has never been out of print. Now, almost twenty years later, the author has revised and updated the text to take into account modern developments in competitive bidding, one of the most rapidly changing parts of the game, not least in the new and varied uses of doubles. Anyone who is at all serious about improving their game needs to own a copy of this book. 2018 IBPA Book of the Year! Bridge is a game of communication between partners. As such, the methods of communication used in bridge -- the bids we make during the auction and cards we play on defense -- constitute a language. Understanding how to speak that language requires more than learning what the different "words" mean; one must know how and why to use these "words." Like words in a sentence, an individual bid's meaning will be augmented and amplified by the context of the auction and sequence of other bids. In order to learn to speak this language fluently, we also have to learn to think correctly. As when we are speaking English, we use our bridge language ("Bringlish") in the pursuit of a goal. The goal of bidding is to get to the best contract, not to follow some rules or "describe your hand." The goal of defense is setting the contract or taking the maximum number of tricks, not telling partner what you hold or giving the "right" signal. Kit Woolsey tackles this subject in characteristic style: clear and logical analysis, supported by numerous example hands. Kit's unique perspective on bridge offers insights valuable to players of all levels. Click "Add to cart" below to purchase the eBook version. The Multi Two Diamonds is a popular convention among tournament players, yet this is the first comprehensive modern book on how it fits into commonly played bidding structures. Various alternative uses for the opening major-suit two-bids, including the popular Muiderberg Twos, are discussed in depth, as well as the popular Multi Landy (Woolsey) defense against 1NT. A substantial amount of space is devoted to defenses against Multi, making this a valuable book even for those who don't wish to play the convention themselves. Notrump openings, and the constructive auctions that follow them, are two of the most neglected areas in bridge literature. Following on from his popular articles in the ACBL Bulletin, Kleinman discusses the principles behind notrump bids and rebids in a variety of situations, emphasizing the ideas and concepts rather than attempting to teach a series of rigid rules. An updated modern version of the definitive book on Polish Club. Includes a description of 'standard' Polish Club and its modern pro-style variations. The book is intended for two groups of readers: those interested in the Polish Club system of playing bridge; those who want to get better understanding of trendy bidding treatments. Includes quizzes, examples from expert play, and a special section on slam bidding. 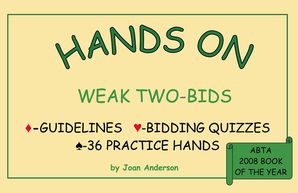 In this sequel to Improve Your Bidding Judgment, the author continues the discussion of the ideas behind good decision-making during the auction at bridge, getting into areas and agreements that were not dealt with in his first book. “I found myself in agreement with the author on almost everything he said.” Julian Pottage. Easley Blackwood introduced and developed the Blackwood Convention. Eddie Kantar then expanded the Blue Team's Roman Blackwood into the Roman Key Card Blackwood that has dominated expert circles for the past half century. Variable Key Card Blackwood may be the next logical step. VKCB allows partnerships to address many problems that neither Blackwood nor Roman Key Card Blackwood solves, while keeping the auction low enough to avoid bad slams. And, better yet, it is relatively easy to use. Suppose you have enough power for slam but only the J732 in trumps, in support of partner's five-card suit. You also know that partner has only one of the top three honors. If the honor is the ace, the slam seems good. If it is the king, the slam is not so good. Using VKCB, partner can tell you which honor he has. What about holding 8732? Now you need partner specifically to have the ace and the jack. VKCB has a solution for that problem as well. In fact, you might also find out about a particular side king, all before committing to a slam and without any cuebidding. VKCB solves your problem without going past the safety of the five-level. In When to Bid Notrump (And How to Play It), Adam Parrish gives the same thorough and understandable treatment to notrump contracts that he gave to trump contracts in his acclaimed When to Draw Trumps. The first section deals with common questions about notrump bidding: when do you need a stopper, when do you bypass a four-card major to bid notrump, when do you choose notrump over a major-suit fit? The second section deals with the thought process and tools declarer needs while playing a notrump contract. Available as eBook for $14.99, or as paperback for $19.95.